Problems to join some servers. Hi. 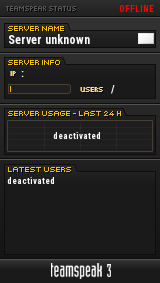 I have problems to join some servers, not all. I think the problem is my USB Netstick coz it changes the ip everytime i close my connect or something like that. Like tonight i was trying to join scrim but here comes the error..
i wish someone can help me out of this problem. thx. and sry for my english, it's rusty. Re: Problems to join some servers. Yeah, sounds like your IP was changed mid game. Really nothing from our end that can fix that. Yeah, but if one server says the error, i can still join the other server, weird. But anyway, i need to keep fighting to join servers? I've had that happen to me as well when I was in a hotel, there's really nothing you can do but to keep fighting with it. Or get a different wireless pickup. It could also be your wireless switch causing it. Never seen anything like that that was caused game side. Okay, gonna keep fighting, and trying to get it working better somehow. Thanks anyway.